Are you familiar with Kringle Candle Co? This is my first experience and so far, I‘m pretty impressed!! Last summer I was spotlighting candles for our blog Candle Scoop… basically just randomly window shopping sites to choose and showcase candles that caught my attention. It’s also a great way to highlight candles I want to try down the road. The moment I entered Kringle’s website, I was drawn in and felt right at home. This website is so well designed… its clean and simple with the perfect touch of elegance… my favorite. It’s also very easy to navigate and their candles… oh my goodness! They are gorgeous!! All their jars are reusable and are offered in a nice selection of styles and sizes with a decent scent list to choose from. While randomly browsing their scent list, Lemon Rind immediately caught my attention and I knew this was the first candle I wanted to spotlight. Lemon is my #1 favorite scent of all time and Kringle’s version sounded amazing! I couldn’t wait to eventually try this candle. Well, my wish came true… a few days after my spotlight posted… a rep from Kringle read it, emailed and asked if I’d like to try it. Would I? Yes, yes and yes!! A week later, my box arrived with my Lemon Rind candle and first sniff… it was everything I imagined. Pure fresh and clean LEMON! It took me a whole year before I was ready to burn it but now with summer in full swing, I was ready to experience this fresh and gorgeous candle! What did my Lemon Rind candle smell like? Is there anyone out there who doesn’t like lemon? It’s so fresh and clean… sweet and refreshing. It’s my “happy” scent and always lifts my spirits. When I first smelled this candle, it brought an instant smile. Lemon Rind smelled like a fresh lemon with the perfect touch of sweetness… a classic lemon that I’ve realized can be very hard to capture. I know because I’ve tried many lemon scents that are supposed to be pure and classic that end up smelling like lemon cleaner or take on a weird fuel smell… lemon lovers… you know what I’m talking about. Time to light my candle! Because it had two wicks and the opening was wide, I decided to burn this candle in my big master bedroom. Once lit… it didn’t take long to get a complete melt pool and the fragrance… a perfect lemon! I loved it! It wasn’t too sweet or too tart, just a wonderfully clean and fresh lemon. My favorite part, it was not fake or chemically like many lemon scents can be, it stayed true from start to end. LOVED!!!!! Strength – this candle gave a steady medium scent throw in a pretty large room so in a smaller room, it will be ultra strong. Loved the strength of this candle. How did my Lemon Rind candle burn? My candle burned perfect. No issues at all. Clean burn, no wasted wax. Just make sure to keep your wicks trimmed or the flames will get big. I was craving a true lemon scent and this candle delivered. I had a feeling I would like this candle when I first decided to spotlight it for CandleScoop and I’m so glad I finally had a chance to try it. This is a classic lemon so if you’re after a true lemon scent with a touch of sweetness, Lemon Rind is a great choice. Once you’re on Kringle’s website, you’ll probably get carried away looking at all their other fragrances and gorgeous candles… that’s what happened to me. I ended up placing a big order for a nice variety of scents so stay tuned for more reviews to come…. 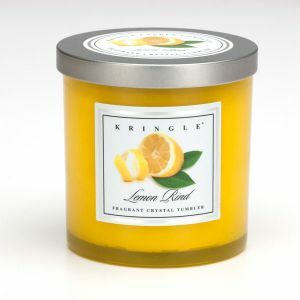 Have you tried Lemon Rind from Kringle Candle Co? Review it with us. In the comment section below, review and star rate your experience… it’s easy! Scent description: The very essence of clean, bright and delightfully-biting, Lemon Rind is a stunningly-accurate natural citrus scent. Ideal any place where freshness comes first.